The new Southpark House website has been completely redesigned to work perfectly on your mobile phone, tablet and computer and we hope that it offers a better experience when you book B&B accommodation with us. While the Southpark House website may have changed, at the guest house itself we continue to offer the same high standard of bed and breakfast accommodation that has seen us achieve Scottish Tourist Board and AA 4 star status, as well as seeing many of our previous customers return time and again. 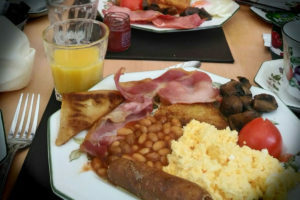 We look forward to welcoming customers old and new with the usual warm welcome, comfortable accommodation and of course our famous traditional breakfast. We participate in the Taste Our Best scheme with Visit Scotland, which is all about serving seasonal, locally sourced produce. At Southpark House, that means we serve delicious produce including local free range eggs, cooked just the way you like, and the finest local smoked salmon, among other tempting breakfast treats! To ensure you benefit from our lowest rates, be sure to call us on 01387 711188 or book your bed and breakfast accommodation online through our long-standing booking partners at Free to Book.